On Sunday, March 6 the Jewish Federation of North America kicked off Tribefest, a three-day event in Las Vegas, NV that billed itself as “an entertaining, interactive and educational celebration” of Jewish Life. Approximately fifteen hundred people aged 22 to 45 were said to attend the conference, participating in workshops led by Jewish leaders from across North America. One of these presentations—entitled “The Kabbalah of Love”—focused on love as a “central theme of Jewish teachings.” A description of the workshop leads with the question: Is love coincidental, or does each of us have a “destiny to connect to another?” Unfortunately the featured speaker participated in one of the larger demonstrations of hate in recent months; Rabbi Dovid Eliezrie of the North County Chabad Center was photographed carrying American and Israeli flags in protest against a Muslim charity event in Yorba Linda, CA. Yet this did not prevent 100 protesters from breaking off from the main event to stand outside the community center, heckling people attending the fundraiser. 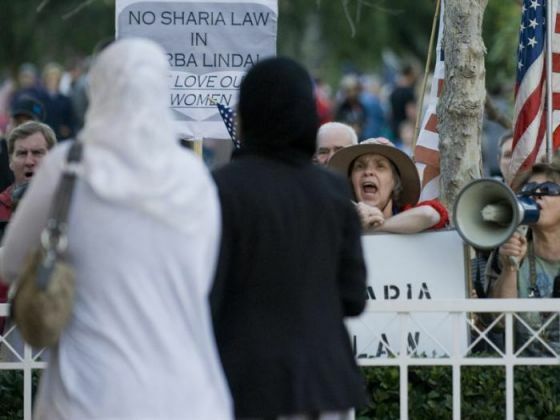 In a video released on March 2 by the Council for American-Islamic Relations (CAIR), people can be heard shouting hateful rhetoric as families—many with small children—walked from the parking lot to the charity event. Among the many slurs yelled by the protesters, several chanted “USA! USA!” “Mohammed was a pervert. Mohammed was a fraud,” and—strangely, given that many attendees were American—“Go back home.” As noted by blogger Max Blumenthal, the shocking bigotry that characterized this event is eerily reminiscent of anti-desegregation protests that occurred at our schools only fifty years ago. To his credit, Rabbi Eliezrie has released a statement disassociating himself with the protestors outside the community center. Yet he falls short of denouncing their message, instead accusing CAIR of releasing the aforementioned video as part of “a long history of distorting the truth.” He states that he discouraged people from attending the other smaller protest, yet he fails to mention that anti-Muslim vitriol was present at his event. When Villa Park Councilwoman Deborah Pauly noted that her son is a Marine, she quickly added, “I know quite a few Marines who would be happy to help these terrorists to a, uh, early meeting in paradise.” The crowd responded to her comment with applause and laughter. As stated by a Muslim woman who attended the charity event, “It is surprising, but everyone has a right to express their opinion.” Rabbi Eliezrie is within his rights, if not his perceived duty, to protest against anti-Israel activists like Abdel Malik Ali. Yet by attending an event which espouses violence and bigotry against Muslim-American families, displaying an American and Israeli flag at the protest, and then failing to denounce the vitriol of his fellow protestors Rabbi Eliezrie has sent a strong message about his politics and those of his larger community. Before he teaches the ins and outs of love to the next generation of Jewish leaders, he should first consider his current association with hate. I would not support out of line comments made by a handful of protest demonstrators. One the other hand one would not expect peace loving gathering to provide a podium to speakers implicated in support of terrorism. So, please, don’t cry wolf painting all protesters with a broad brush as hate mongers. Their message was clear: there is no room in US for terrorism support in any form.